In this tour you’ll get picked up from your Waikiki hotel and taken to the Diamond Head at 6:20 am. You’ll be rewarded with breathtaking views overlooking the Pacific Ocean and Honolulu. 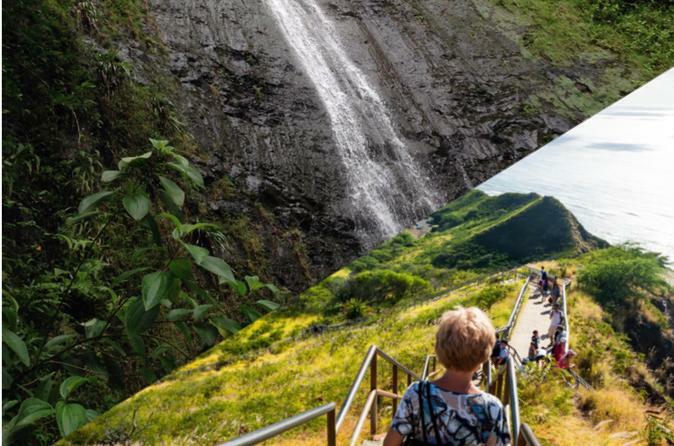 After hiking the Diamond Head you’ll be taken to the famous Manoa Waterfall Hike at around 9 am, the trail was featured on many movies & tv shows like lost and Hawaii 5-0 so make sure to bring your camera! The driver will provide you with a bottle of water for both attractions and walking sticks (at the Manoa Falls)!